Here's the best of the webs Vietnam golf course information. If you prefer to ask our Vietnam golf experts, please send an email to VIETNAM GOLF EXPERTS who will reply within 24 hours. 2008 was a pivotal year for Vietnam golf, thanks in no small part to its growing golfing industry. 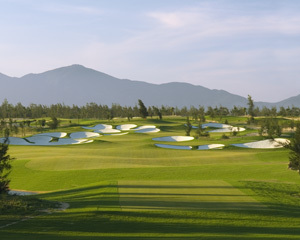 An increasing number of high-end Vietnam golf courses, as well as the formation of the Ho Chi Minh Golf Trail (a collaboration between seven of the country�s top courses) have earned the country welcome exposure in over 100 international publications and catapulted Vietnam, according to Dr. Nguyen Ngoc Chu, General Secretary of the Vietnam Golf Association, into �the big time�. The icing on the golfing cake, however, was the naming of the country by the International Association of Golf Travel Operators (IAGTO) as its 2007 �Undiscovered Golf Destination of the Year� earlier this month. At present, there are about 16 golf courses operating in the country, with more than 30 projects at some stage of construction. Golf in Vietnam has experienced a surge in popularity this year, and international travellers� love affair with golf is largely responsible for Vietnam�s 48th place ranking among the New York Times� 53 hottest destinations for 2008. Courses especially singled out by the paper include the Dalat Palace Golf Club, Ocean Dunes Golf Club and the Montgomerie Links � Vietnam. The country�s tropical climate, thousand-mile coastline and reasonable cost of living have all encouraged a growth in the number of international arrivals to Vietnam, up from 250,000 in 1990, to around 4 to 4.5 million in 2007. Play golf in Vietnam when you are golfing in Asia next. Asia's undisputed golf destination keeps getting better each year. This island paradise is fast becoming Asia golf's hidden gem. A must on your Asian golf hoiday for the adventurous golfer. Play Golf in Cambodia and experience the cultural wonders of Asia. Be one of only a few golfers in the world to play golf in the land of Laos. The Ultimate golf guide for planning your golf holiday to Thailand. Tee it up in style at Asia's leading golf courses with the regions most trusted golf tour company - Golfasian.com.